“Never doubt that a small group of thoughtful, committed citizens can change the world. Indeed, it is the only thing that ever has.” The Hammer Blow is the perfect illustration of anthropologist Margaret Mead’s famous quote. The book tells the extraordinary story of how, in January 1996, ten women activists, including author Andrea Needham, worked to disarm a British Aerospace Hawk jet which was about to be sent to Indonesia. Led by the murderous dictator Suharto, in 1975 Indonesia invaded the former Portuguese colony of East Timor and proceeded to carry out what US dissident Noam Chomsky described as “one of the greatest bloodlettings in modern history compared to total population”. Approximately 200,000 people – about a third of the total population – are reported to have died by the mid-1990s, with the Indonesian forces using the British-made Hawk jets to subdue the East Timorese. Appalled by the UK government aiding and abetting Indonesia’s genocidal actions, and having unsuccessfully lobbied British Aerospace and the government, the ten women formed an affinity group to explore how they could stop the slaughter using direct action. The preparation for what is now known as the Seeds of Hope East Timor Ploughshares Action took ten long months. Needham explains the group bonded over a number of weekends including lengthy “life-sharing” sessions and “spent a lot of time discussing philosophical questions: militarism, patriarchy, co-operation with authority, secrecy and openness, when is it right to break the law”. Like the rest of the book, Needham’s account of sneaking into the British Aerospace factory at Warton and disarming the Hawk – that is hammering and smashing parts of the aircraft – is absolutely riveting. Eventually discovered by security, the three women who carried out the action – Needham, Jo Blackman and Lotta Kronlid –along with Angie Zelter, were arrested. Reasoning they acted to prevent a larger crime, their subsequent trial in Liverpool is a fascinating and uplifting example of passionately principled people presenting their case to the conservative British legal system. “I’m not breaking the law, I’m upholding it”, Kronlid told the prosecutor. After six months on remand in prison and a huge support campaign publicising their actions the four women were acquitted by the jury on 30 July 1996 to jubilant scenes outside the court. “In twenty years of resistance we were never able to shoot down an aircraft”, Jose Ramon Horta, the future President of East Timor, noted in a letter to the women in prison. “You did it without even firing a single shot and without hurting the pilot”. 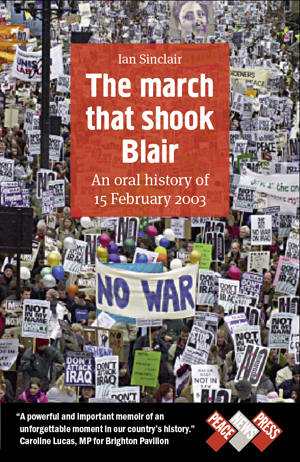 Frustratingly, after it was elected in 1997 Tony Blair’s Government, with Robin Cook as Foreign Secretary, refused to stop arming Indonesia – “exposing Labour’s ‘ethical foreign policy’ for the sham it was”, notes Needham. Yet, the action of these dedicated activists arguably played a role in ending the occupation of East Timor and will inspire fellow activists for years to come. Best of all it is a barnstorming and engrossing read that will have readers racing to the end to find out what happens next. This entry was posted in Nonviolence, Protest/activism, UK Foreign Policy and tagged Andrea Needham, East Timor, Indonesia, Margaret Mead, Robin Cook, UK foreign policy on April 12, 2016 by ianjs2014.